The Lamptons, formerly known as London Road, transformed a disused 1970s office block in Hounslow, and delivered an outstanding and sustainable development of 155 homes, 74% of which were affordable, as part of a multi -million pound regeneration of the town centre. The scheme offered a unique opportunity for the reuse of a valuable piece of brown -field land for much needed residential accommodation, helping to meet local needs. The affordable element of the scheme included 27 shared ownership homes, 74 affordable rent and 14 homes for over -55s who are looking to downsize. The scheme represents the transformation of underused offices in a substantially residential area to create essential new housing. 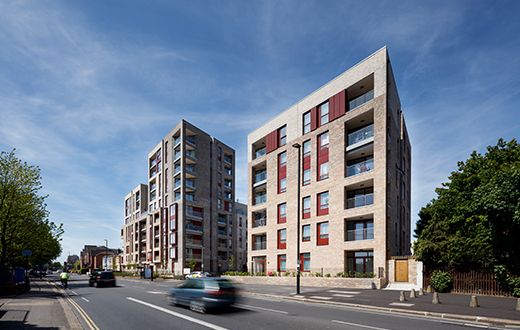 A2Dominion worked with London Borough of Hounslow throughout the process in order to deliver a range of mixed-tenure affordable units which addressed the shortage in affordable housing in the area while offering a high quality and desirable place to live.